For Jupiter's current position and visibility, see the Planet Wheel. Notes More massive than all the other planets of the Solar System combined, Jupiter is a gas giant that orbits the Sun beyond the Asteroid Belt, at a distance more than five times that of Earth. 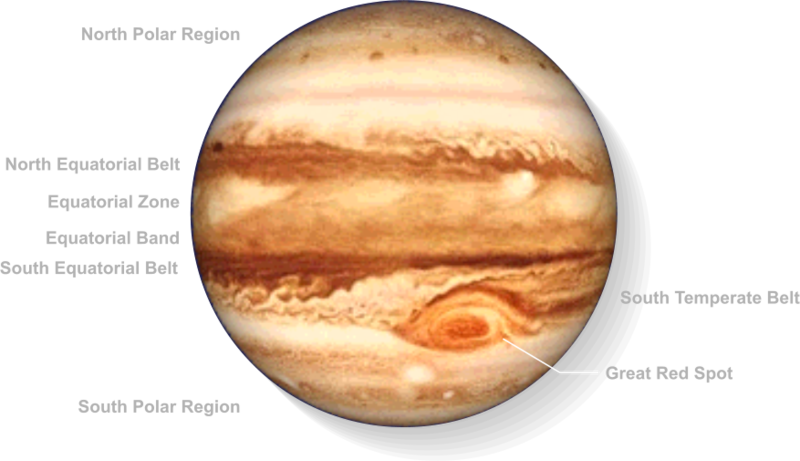 Jupiter has no permanent surface, so a fixed map of the planet cannot be produced. Nonetheless, there are some persistent features, such as its pattern of atmospheric belts, and the famous Great Red Spot. Appropriately named after the king of the Roman gods, Jupiter dwarfs the other worlds of the Solar System. It is perhaps most famous for its Great Red Spot, but its four prominent Galilean moons are also a distinguishing feature. The majestic world of Jupiter, by far the largest of the Sun's family of planets. To the far right of this image is Jupiter's moon Io, a body almost exactly the same size as Earth's Moon. The tiny shadow cast by Io can be seen in Jupiter's equatorial regions. A moment in history: Jupiter as it was first observed by Galileo on 7 January 1610. Galileo initially mistook Jupiter's bright companions for background stars, but he soon reached the revolutionary realisation that he was seeing moons circling another planet. From left to right, the moons seen here are Callisto, Europa and Io (so close they appear as a single body) and, on the other side of Jupiter, the giant moon Ganymede. Jupiter is by far the largest and most massive of the planets in the Solar System. With a diameter more than eleven times that of Earth, it dwarfs our own small blue planet. Use the scrollbar on the right of this window to explore the moons of Jupiter, shown to scale. (Values shown are mean distances from Jupiter, though note that several of the planet's outer satellites have eccentric orbits).